Ryan recently chose Matt Stajan as the sentimental MVP of the Flames first round. It’s not a bad choice – Stajan did in fact have an excellent series, despite playing a pretty tough role. 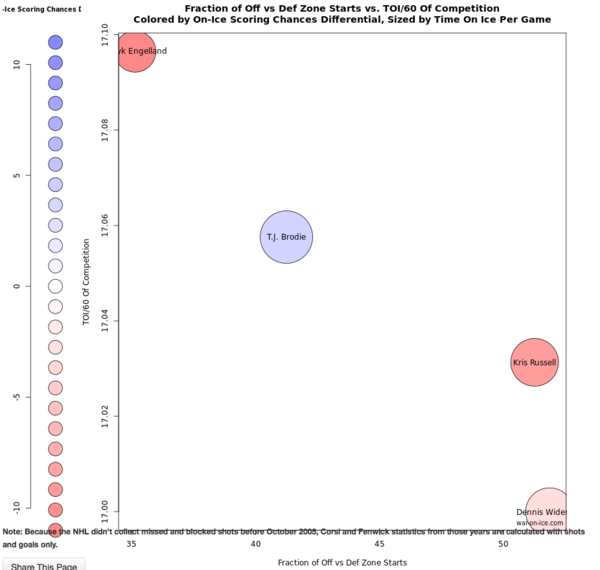 Nevertheless, I was going through the numbers today and I think another skater bears an honourable mention: TJ Brodie. The youngest regular defender on the Flames blueline is also it’s best in the absence of Captain Mark Giordano. Aside from his four points in six games, Brodie provided a steady, stabling influence on the back-end that was likely one of the key reasons the Flames were able to complete the upset. Via War on Ice, here’s a series of graphs that illustrates just how good Brodie was against the Canucks. Quick primer on these usage charts: the colour of the bubble represents relative possession rate (blue = higher, red = lower). The Y-axis is quality of opposition and the X-axis is % of offensive zone to defensive zone starts. Which means, the higher up and further left a player is, the more difficult his assignment. This is the Flames top-4 rotation. The difference in quality of competition between all the players looks severe, but that’s only because of the data range on the graph. In actuality, they all played about the same level of bad guys. The difference in zone starts is bigger though. Like the regular season, Dennis Wideman and Kris Russell started more often in the offensive zone, while Brodie and (especially) Deryk Engelland saw more defensive zone draws. As you can see, Brodie is the only blue dot on the map. Meaning, he’s the only defender with a better relative possession rate than the team. Get used to seeing that blue bubble. This is the same graph, except the bubble colour is determined by on-ice scoring chance differential. Once again, Brodie remains in the positive. I should stop here to remind you his most frequent partner was Deryk Engelland, the guy with the persistently dark red circle (who, to be fair, was playing way over his head in the series). Finally, the goal differential with each player on the ice. Wideman edges into blue bubble territory, but still there’s Brodie’s unwavering bright blue orb in the middle of the screen. One final graph to illustrate Brodie’s influence. Over the last two seasons, Mark Giordano has been considered a Norris trophy caliber defenseman. And while it’s true that Giordano has been a quality blueliner for years, it’s not a coincidence that he took another step forward when Brodie became his regular partner. Flames fans have a lot of reasons to be excited about guys like Johnny Gaudreau, Sean Monahan and Sam Bennett. But they shouldn’t forget about the incredible 24 year old talent who is emerging as a star on the blueline. Shhhh…stop talking about how good Brodie – other teams might notice (though, I doubt they haven’t already). He’s not a flashy player, but boy does he skate well. Someone in another thread made a comparison to Scott Niedermeyer and I thought it was ridiculous. But I don’t think its as crazy anymore. Nieds was a ridiculously good player – Brodie isn’t quite at that level – but he carries the same calm, smooth demeanor and skating skills. I’d say that Brodano is the biggest difference between the Flames & Oilers rebuilds, full stop. Monahan & Gaudreau are great and all, but having a real top pairing defense is the reason this team didn’t sink all season. And you get all this at half the cost of PK. A lot of that was Mtl’s fault for insisting on a bridge contract for a player of proven ability. They could easily have signed him long term for 5-6 million and they screwed up hard. Didn’t Calgary do much the same with Brodie? Two year bridge contract to make sure they knew what they were getting before a long term commitment? They gave Brodie a bridge, yes. Difference being that Brodie had a career high of 14 points, and hadn’t even played a full season in the NHL. Subban had two full NHL seasons scoring in the high 30s for points, as well as being amazing in a playoff run for the team. Kent and a number of others argued for signing Brodie long-term anyway, because his on-ice effectiveness was so good in comparison to his expensive stats (scoring numbers) and reputation, but a bridge deal still made a fair bit of sense for him if the team wanted to be conservative. For PK? Zero sense. He was established; he was excellent. Even if PK had never gotten any better from his 2012 abilities, he still would’ve been solid value at 5 million a year. Granted, part of what screwed Montreal over was the new cap structure and contract length rules, but they still missed out on a great opportunity for a high value Duncan Keith-style contract. Nice. This article had major clickbait title potential (“You won’t believe what these 4 graphs say about TJ Brodie”). Is there a place to find WOWYs for playoff games? 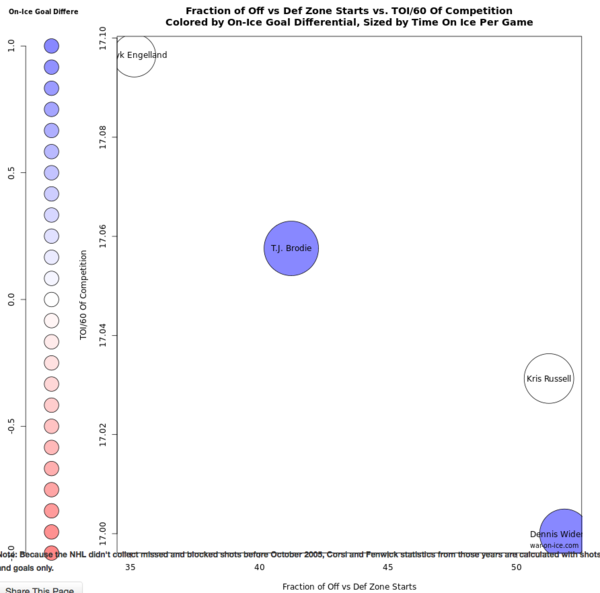 I’m curious what the split is between Brodie w/ Engelland and Schlemko. I think Brodie could be our X factor against the Ducks. If he can continue to join the rush, and keep them on their toes. Treliving, yesterday, said that Brodie was the best player in the series and was the straw that stirred the Flames drink. With the Brodie and Backlund love it’s refreshing to see the higher ups are picking up on how good these guys are. Also, Engellend is doing his beastly best eh? Tough go for that guy. 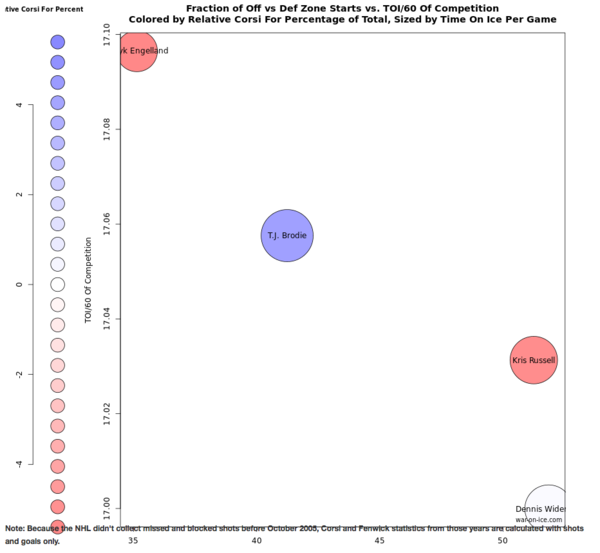 I wonder how much Engelland’s numbers are skewed by that one 5 minute shift from Hell he had in game 6. As for Brodie… The Flames need to clone him ASAP. So….to sum up…Brodie is a bright blue orb and a very good player. Oh…and he stirs drinks and makes us all go WOWY! Got it!